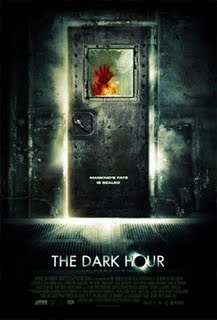 The Horror Section: So, Is This Hour Dark Or Cold? Whew. This is literally the first opportunity I’ve had to update you on what’s been going on the last few days. All my time not spent in theatres, has either been in bars, sleeping, or driving in between the two. It has all been worth it though, as this year’s Toronto After Dark has been a bloody good time so far. The opening movie Black Dynamite, a blaxploitation spoof, was absolutely hilarious and the party afterwards was a whirlwind of revelry and great conversation. The last survivors of an apocalypse try to exist in an underground bunker. Not only do they have to contend with infected ‘strangers’, but also a frozen presence that roams the halls at night. Let’s start off with the positive, shall we? The production design was fantastic in this film. The bunker where the film takes place looks worn and lived in and really made me glad of the sunlight outside the theatre afterwards. The acting is also strong, especially that of the child protagonist, Jesús (Omar Muñoz). This seems to be a regular theme with Spanish genre films and they often excel because they seem to have a deep pool of child talent to pull from over there. The creature designs – what you see of them – were also well done and the film had surprisingly good CG for a production this size. The ending was definitely one of the visual high points of the piece. Unfortunately, there is a lot of stuff that detracts from The Dark Hour. I think the pace hurts the film a little bit. It is not that I have a problem with films that take their time (The Eclipse, a film I recently saw at Fantasia was perhaps the slowest film I’ve seen in a while, but always engaging), but The Dark Hour never seemed to get going for me. It often meandered, never focusing on one thing for long enough to clock into it emotionally. It also didn’t help that I had a really hard distinguishing the male characters from one another. I need more than just the dudes having different degrees of facial hair to tell them apart. Even a subsequent discussion outside the theatre didn’t help sort out who was who. It seems to me that there was a much better movie in here somewhere. I think if the filmmakers had decided on one direction and went with it, I would have been more receptive. This movie is certainly watchable fare, but compared to some of the solid stuff the Spaniards have been putting out in recent years (The Orphanage, [REC] & Shiver), The Dark Hour fell a little short for me. It's been a whirlwind hasn't it? I totally missed that the title was different than the term they used in the film. Production design was indeed excellent, awesome review.